There's nothing like a nice hot shower to keep you clean and relaxed. It cannot be more disappointing when it does not heat up as expected. A heater can easily be overlooked until cold water runs in the bathroom. Here are some quick water heater repair troubleshooting steps and signs that you may be in need of Water Heater Replacement in Chandler, AZ. -Check if the power is connected and reset the thermostat. -Flush the heater to remove any sediment that's settled into the tank. -Raise the temperature setting to your desired water hotness. -Check if the gas is connected and that the pilot flame is lit. Same as electric heaters, flush to remove sediments in the gas water heater. Raise the thermostat's temperature setting. 1. Sizzling noises. Drain the tank until the water clears to remove sediments that have collected in your water tank. 2. Pressure-relief valve leak. In such water heater repair scenario, you may need to have the valve replaced. 3. Faulty thermostat. Try adjusting settings and see if the water temperature changes in line with it. 4. Water supply pipe leak. Tighten pipe fittings, and if this water heater repair step does not suffice, you may need to let go of old fittings and have them changed. 5. Electrical Problem. See if there is no blown fuse or tipped breaker that's caused the failure. If the water heater repair steps outlined above do not work, then a Water Heater Replacement in Chandler, AZ may be the best option for trouble-free use. 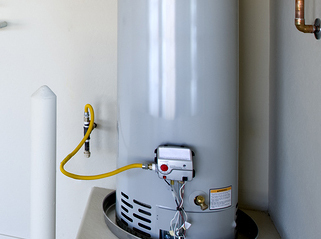 A water heater's life expectancy is typically 8-12 years, considering factors such as proper maintenance schedules, water quality in your home, manufacturer's suggested service life, tank unit's design, and the installation itself.